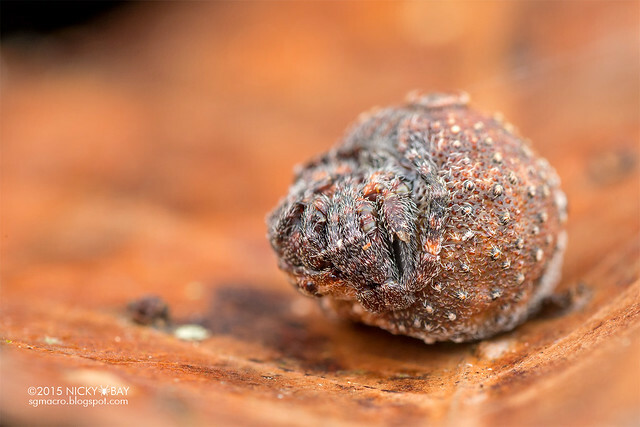 In the last 2 nights of my trip to the Peruvian Amazon organized by Rainforest Expeditions, I photographed 2 rare specimens of the Roly Poly Orb Weaver - Xylethrus scrupeus Simon, 1895. 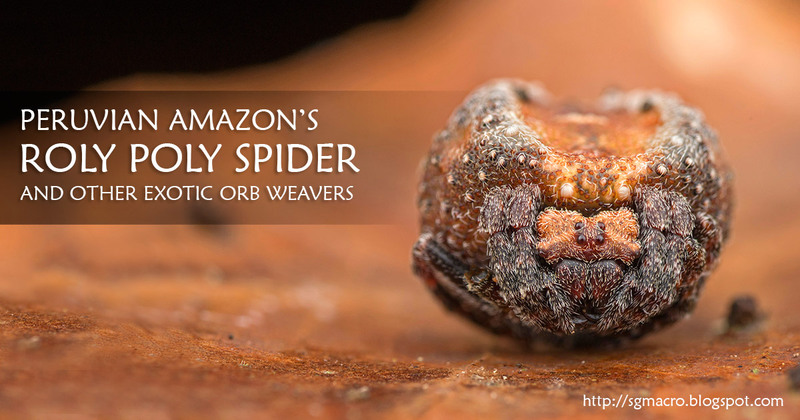 This spider tends to drop from its web when approached and rolls up into a cute ball when it hits the forest floor. 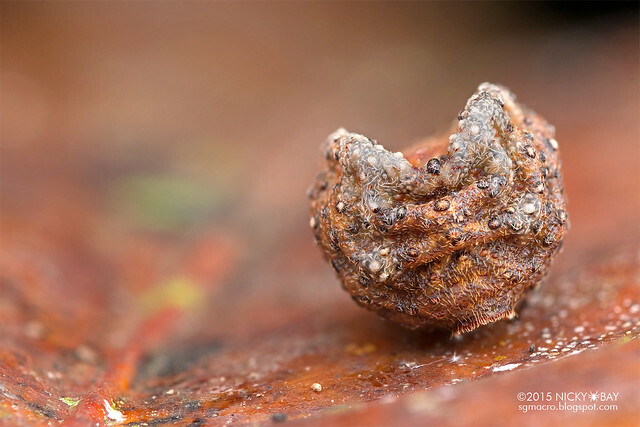 When I picked it up on a leaf, it would just roll off and disappear into the leaf litter again. 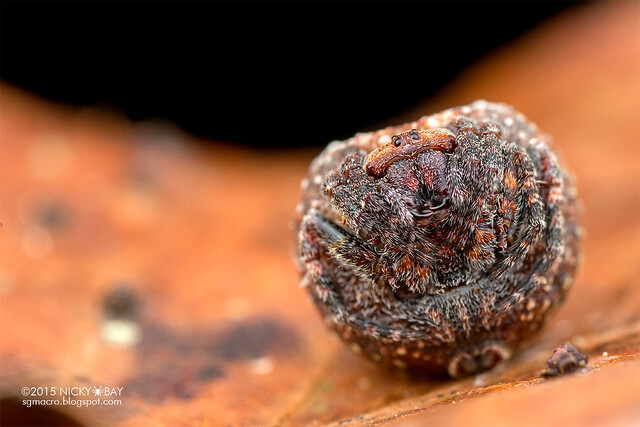 It would remain motionless and camouflaged in the leaf litter like a ball of poop for a period of time, and return to its web after it was deemed safe enough. 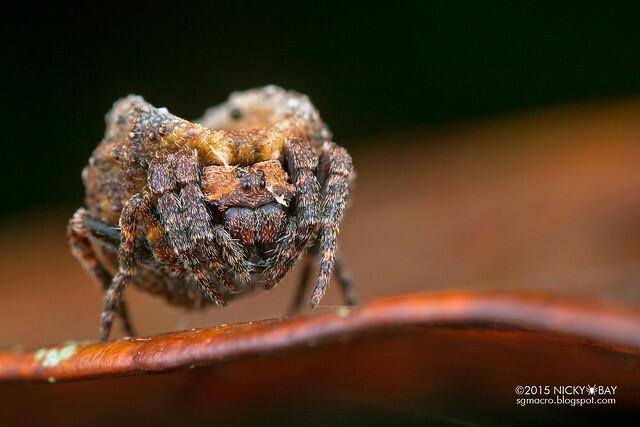 The female Xylethrus has an abdomen that is as wide as long or slightly wider, covered with sclerotized discs with round hemispherical tubercles. The abdomen has a distinct anterior median flat disc. 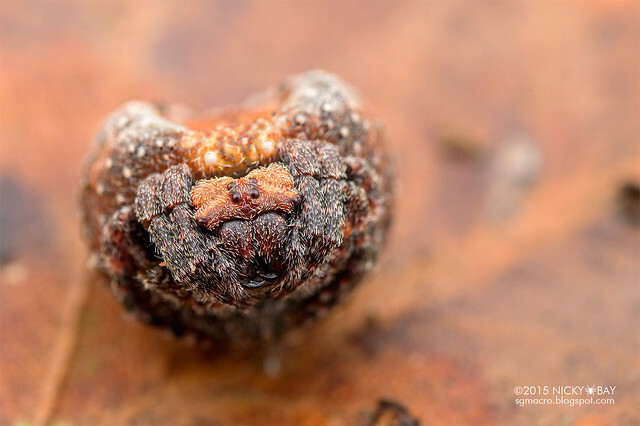 The spinnerets are also surrounded by a sclerotized ring. 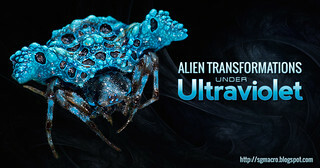 The sternum is also as wide as long or slightly wider, and truncate posteriorly between coxae IV with several tubercles along the edge. 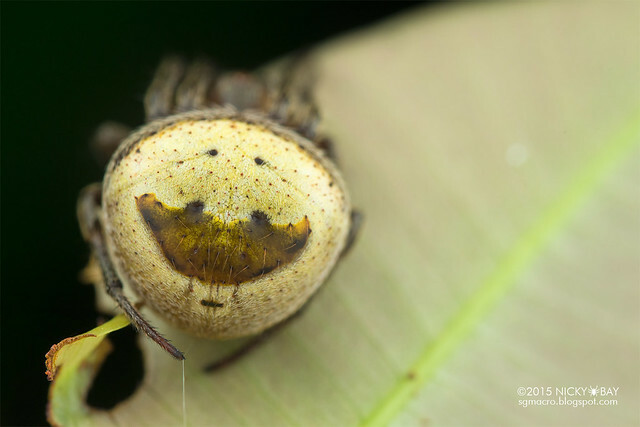 The second part of this post focuses on the genera of Araneidae that I found in Tambopata, Peru. Here's a quick list for reference. 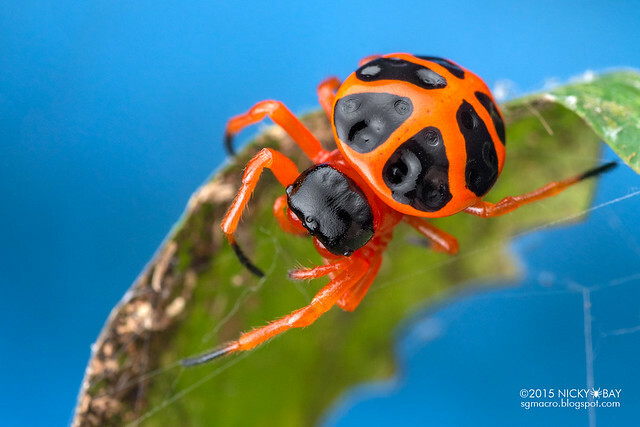 Most references were made from Herbert W. Levi (1996) - The American Orb Weavers Hypognatha, Encyosaccus, Xylethrus, Gasteracantha, and Enacrosoma (Bulletin of the Museum of Comparative Zoology at Harvard College 155: 89-157). 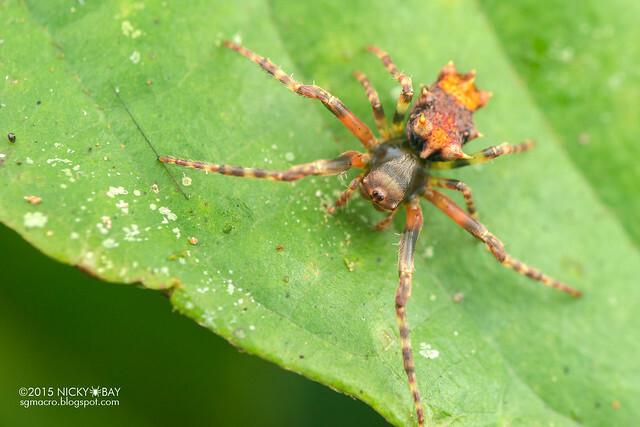 Special thanks to Pedro H. Martins for his kind help in identifying the spiders, as well as Vico Moscoso and Jeff Cremer for ploughing through the trails with me. 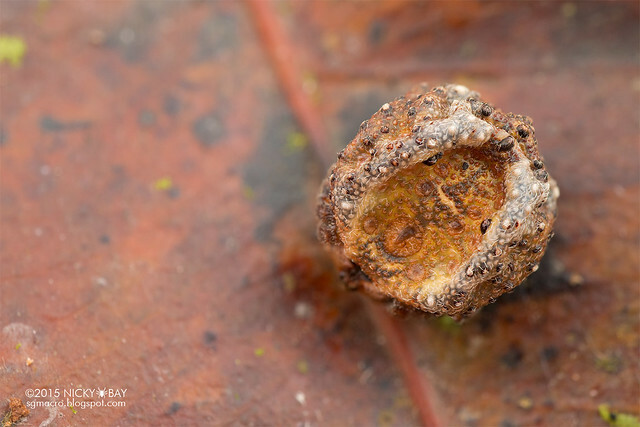 The first specimen we found was just a tiny blob at about 6mm wide. It dropped to the forest floor very quickly as we approached. The dorsal view reveals the anterior median flat disc. Playing dead while rolled up. 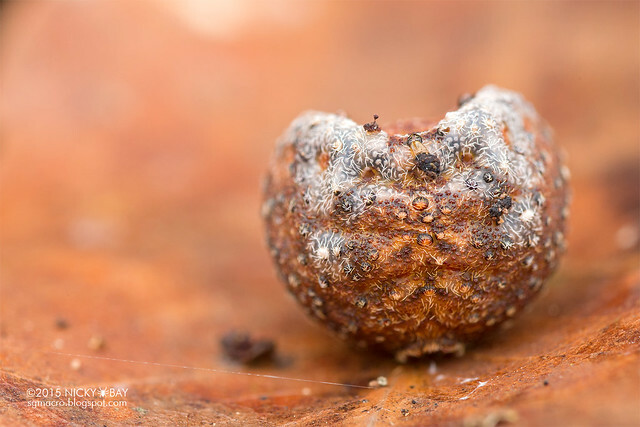 This specimen looks like it has not eaten in a while. 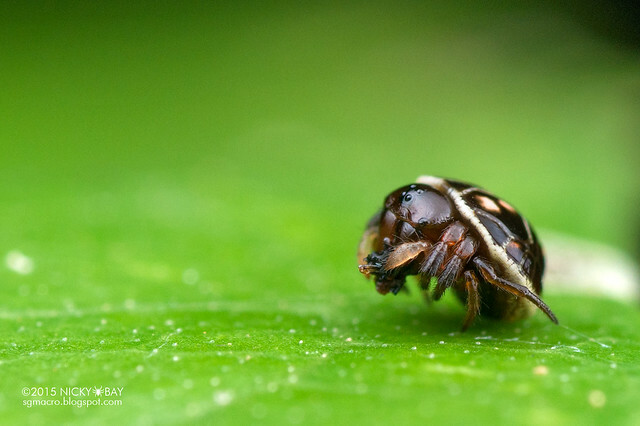 Lateral view - all legs are tucked in neatly. 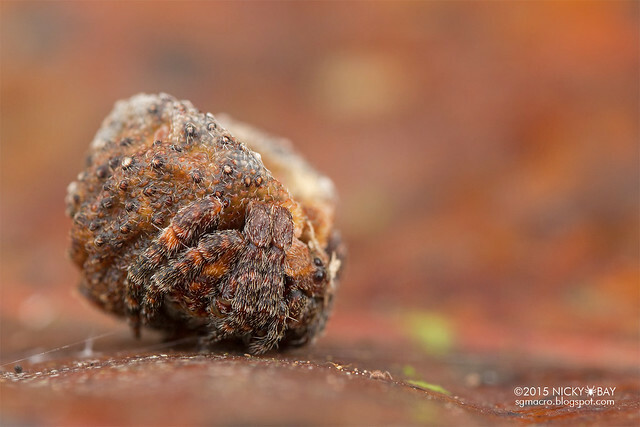 Posterior view - can hardly tell that it is a spider! Finally wakes up! 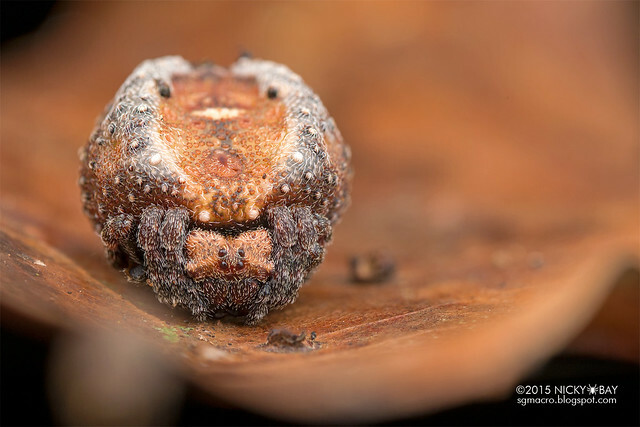 The spider rolled around the forest floor again and woke up with bits of dirt on its face. Striking a very handsome pose. On the last night, I found a much larger Xylethrus! It looked like it had just fed, with an obviously swollen abdomen. 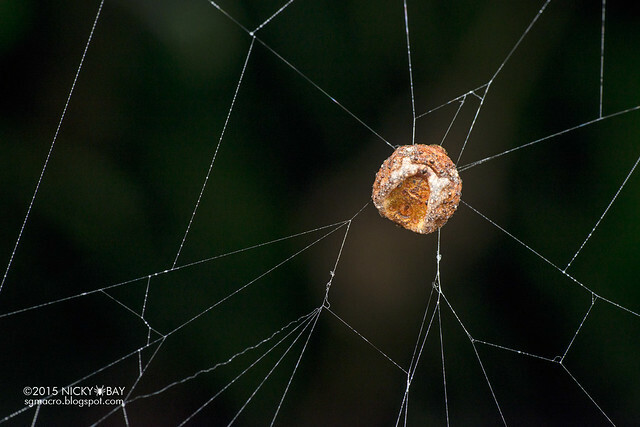 As usual, it dropped to the forest litter when I approached, while leaving an escape line from its spinnerets to its web so that it can return when the coast is clear. 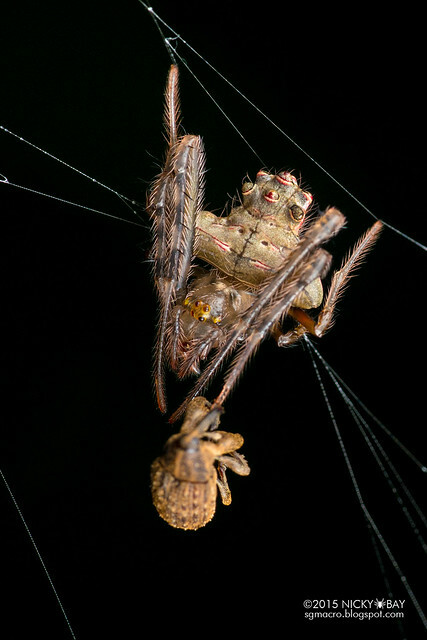 The sclerotized ring around the spinnerets is very clear in this photo, as well as the posteriorly truncated sternum between coxae IV. 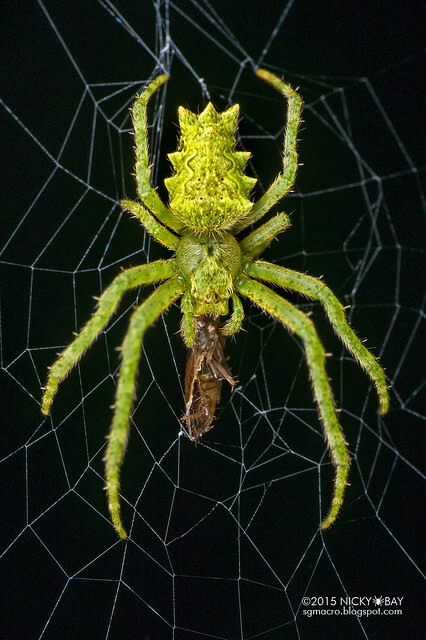 Due to the swollen abdomen, the tucked in legs are less conspicuous - could hardly tell that it is a spider at all. Rolled over for a shot of the face. Posterior view - surprisingly, some tubercles do not seem symmetrical. 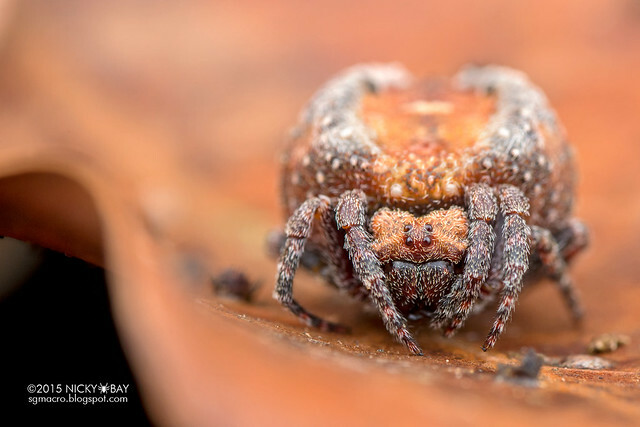 The spider rested at any position after rolling around. Closer dorsal view, showing the anterior median flat disc and hemispherical tubercles. 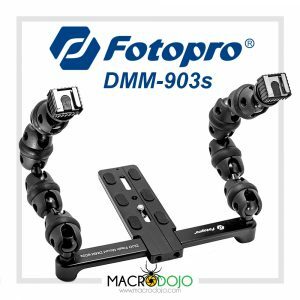 It remained motionless after rolling, regardless of how unnatural the resulting position was. At this position, it would be more likely to "wake up" and walk away soon. True enough, she stood up slowly and started to get a feel of her surroundings. 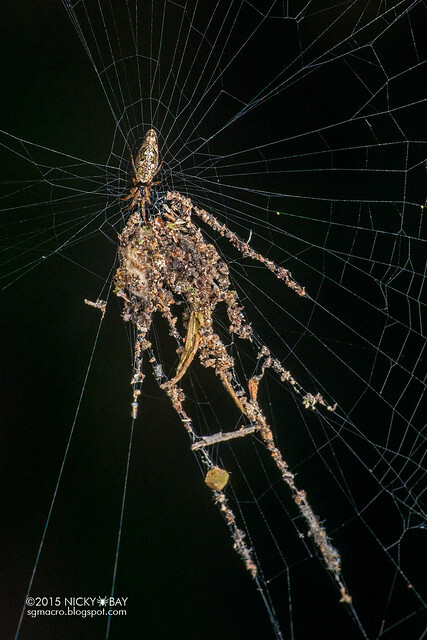 She started hobbling around clumsily, and we returned her to her orb web. 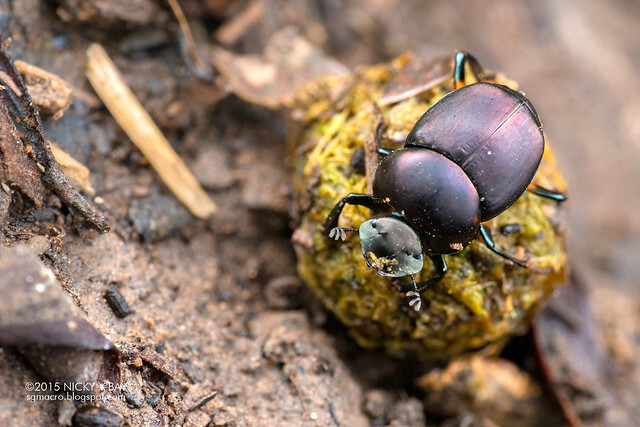 Interestingly, we found several dung beetles rolling balls of poop around, could Xylethrus be mimicking a ball of dung? 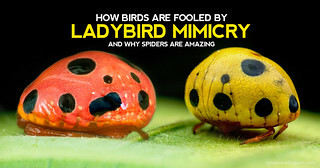 Seems unlikely since it is an orb-weaver and should only capture prey on its orb web. 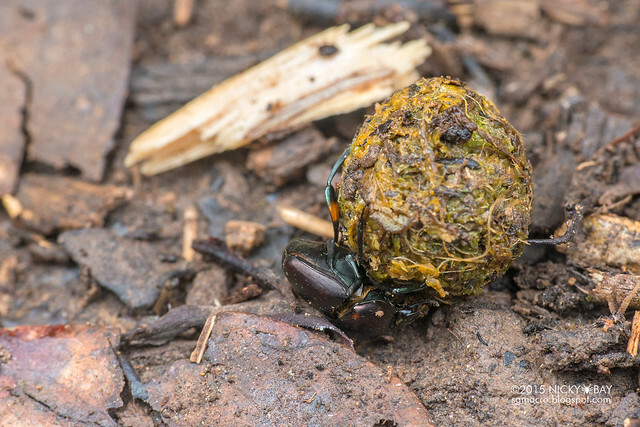 Shot of the dung beetle on top of the poop ball. 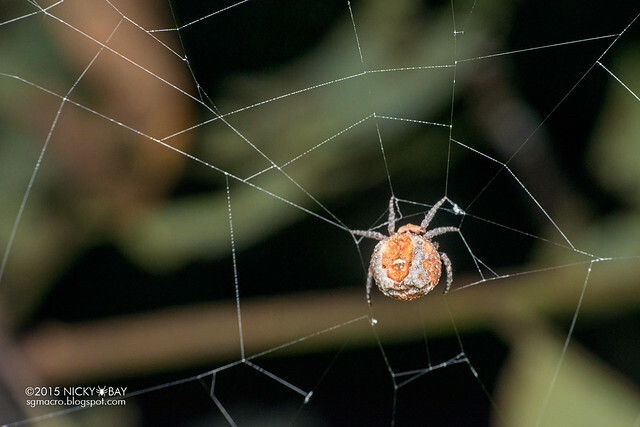 Several other genera of orb weavers (Araneidae) were documented on this trip. There were too many to do detailed posts for each genus, so I'll list a summary of the genera here. 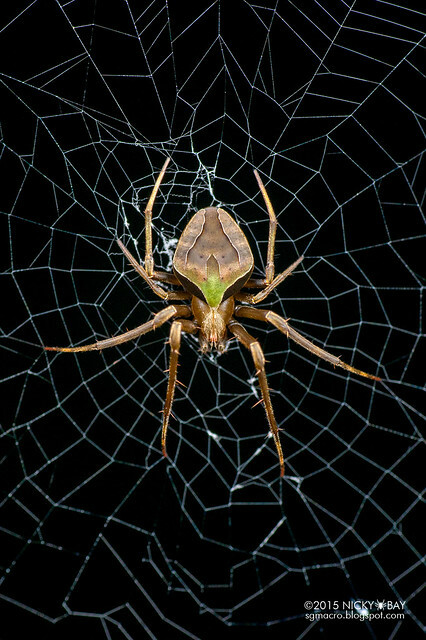 A stunning species in this photo, especially when perched on its orb web. View the Acacesia album. 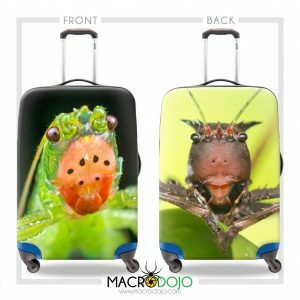 Found Alpaida alpaida and Alpaida truncata on this trip. View the Alpaida album. 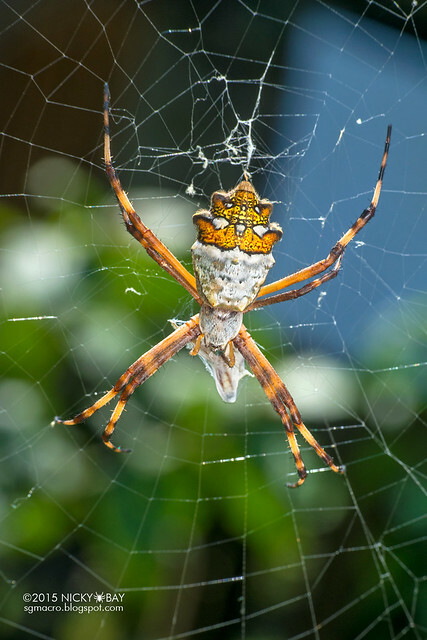 Several specimens of Argiope argentata were found just beside the lodge. 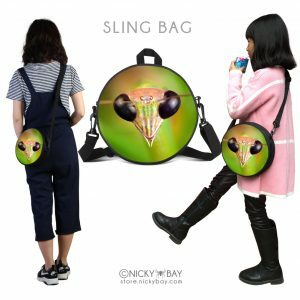 View the Argiope album. 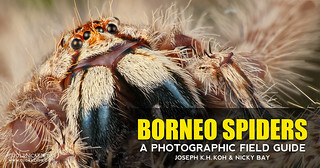 Both male and female specimens of Aspidolasius branick were photographed. View the Aspidolasius album. 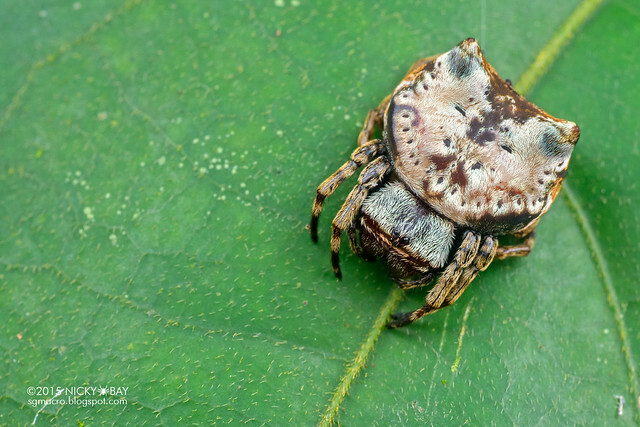 Cyclosa in the Peruvian Amazon is commonly known as the decoy spider for building stabilimentum to a spider-ish shape. 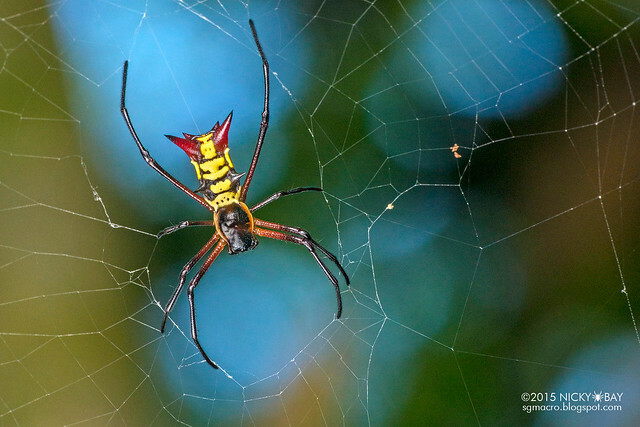 Usually called the trashline orb weaver in Asia! 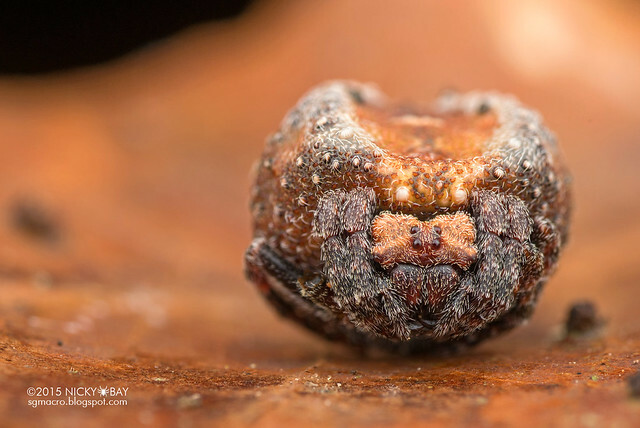 View the Cyclosa album. A beautiful Encyosaccus sexmaculatus was spotted in the day, allowing the bright sky colour in the background. 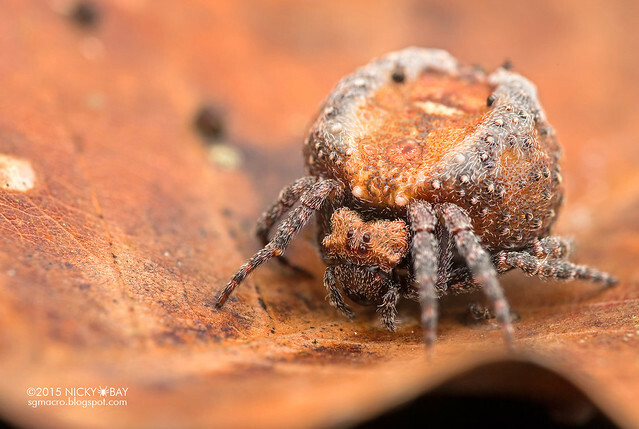 Read more about this spider in an earlier post on Tortoise Orb Weavers. 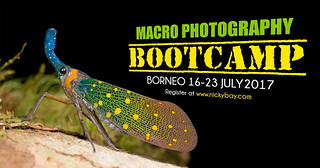 View the Encyosaccus album. 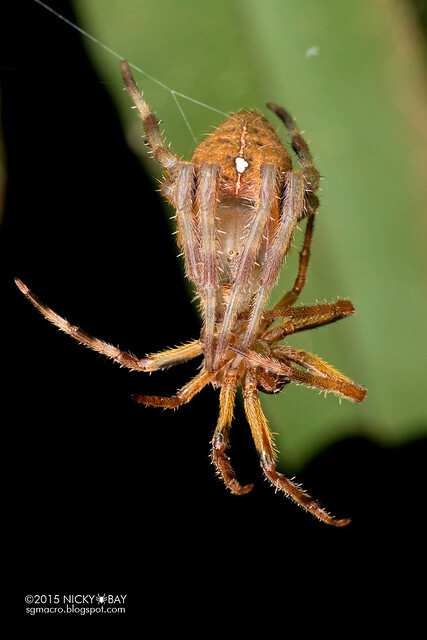 This Eriophora is large and very commonly seen in the trails. More colourful ones were also spotted in my Belize trip. 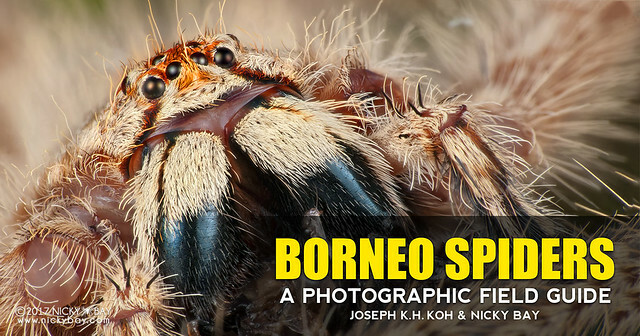 View the Eriophora album. Several morphs of Hypognatha scutata were spotted at Collpa Island. 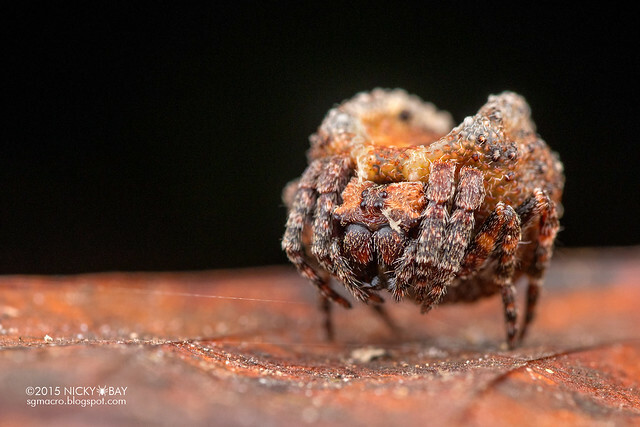 Really adorable but tiny turtle back orb weavers! 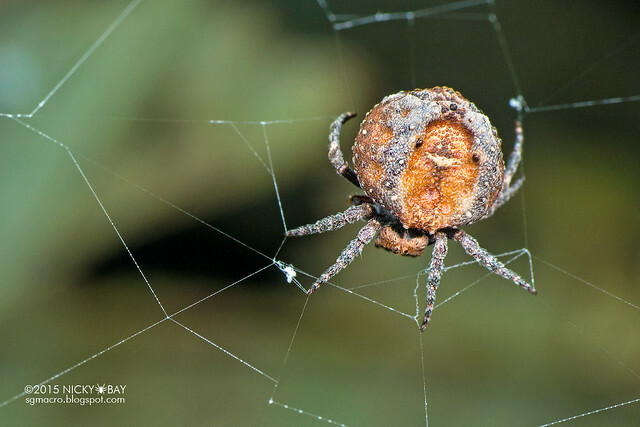 Read more about this spider in an earlier post on Tortoise Orb Weavers. 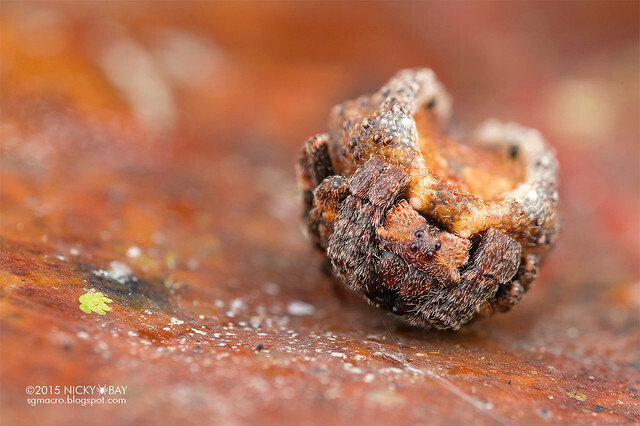 View the Hypognatha album. 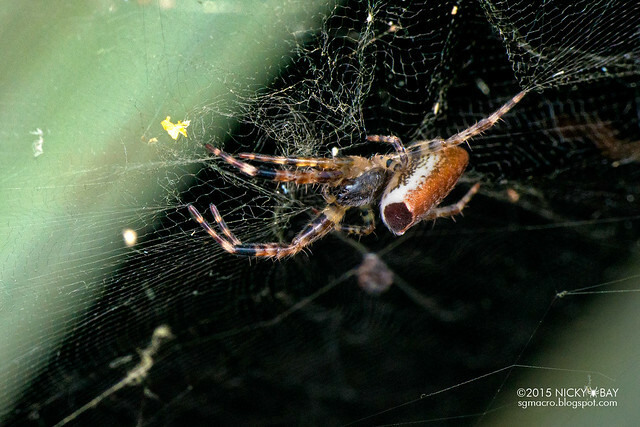 This tent web spider was initially mistaken to be a Cyrtophora, but later identified as Kapogea sellata. View the Kapogea album. 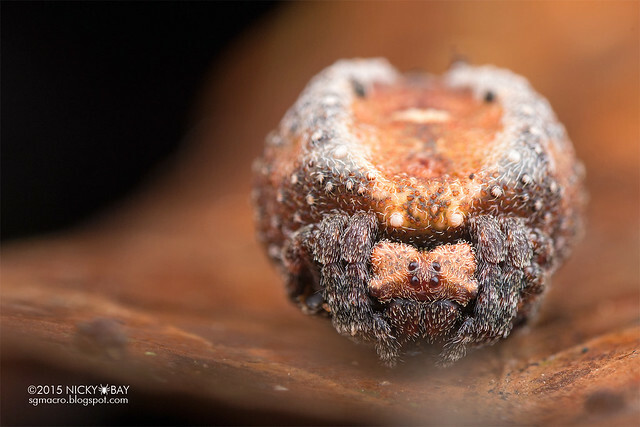 An inconspicuous orb weaver, also found on Collpa Island. View the Mangora album. Vaguely resembles Zygiella that we have in Singapore. View the Metazygia album. 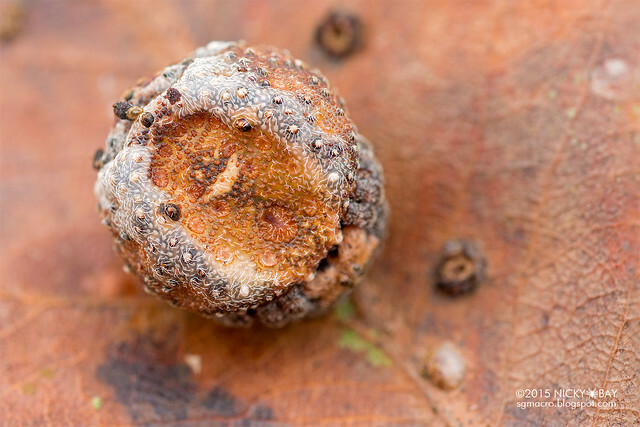 At least 9 different species were identified in this flamboyant genus of thorn orb weavers. 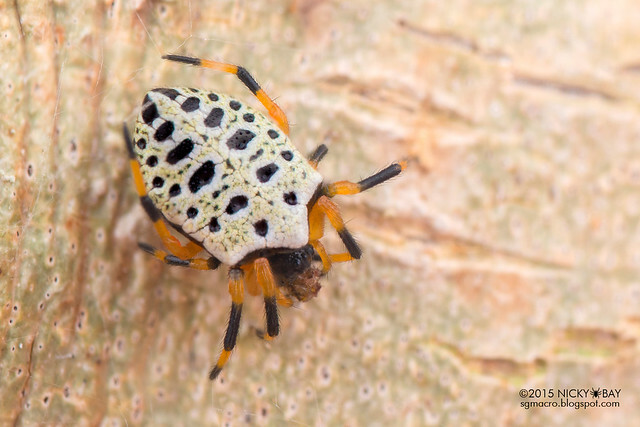 More photos of Micrathena are posted in Thorned Heart and Other Thorn Orb Weavers. 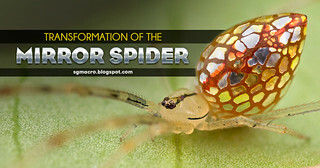 View the Micrathena album. 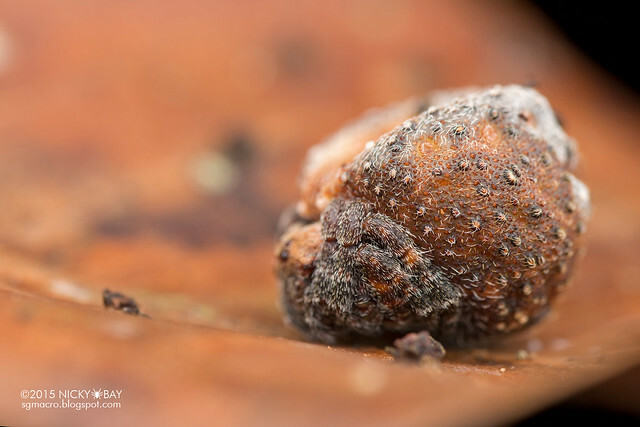 Only one shot of Ocrepeira covillei as it disappeared into the leaf litter. View the Ocrepeira album. Very different from the common Parawixia dehaani in Singapore! 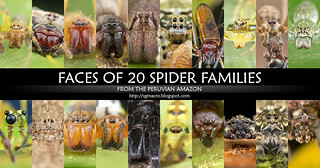 View the Parawixia album. 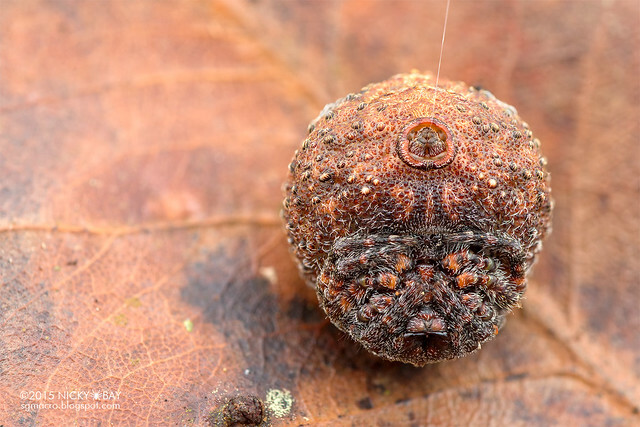 And of course, the star of this post, Xylethrus scrupeus the roly poly orb weaver. View the Xylethrus album. Verrucosa has incredibly distinct posterior abdominal tubercles. A black-yellow species was also recorded in my Belize trip. View the Verrucosa album. 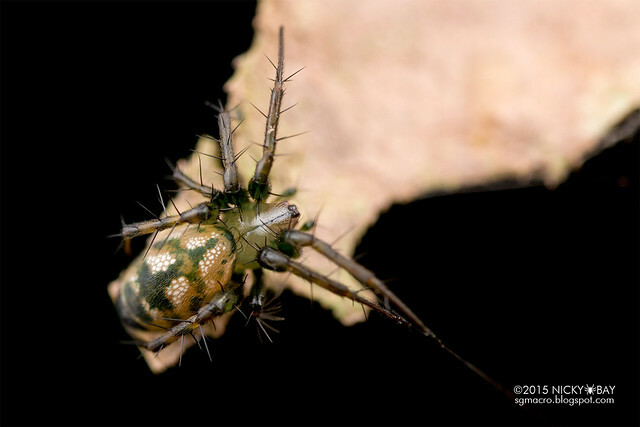 Wagneriana is very common in the trails of Tambopata, with several abdominal dorso spines. View the Wagneriana album. 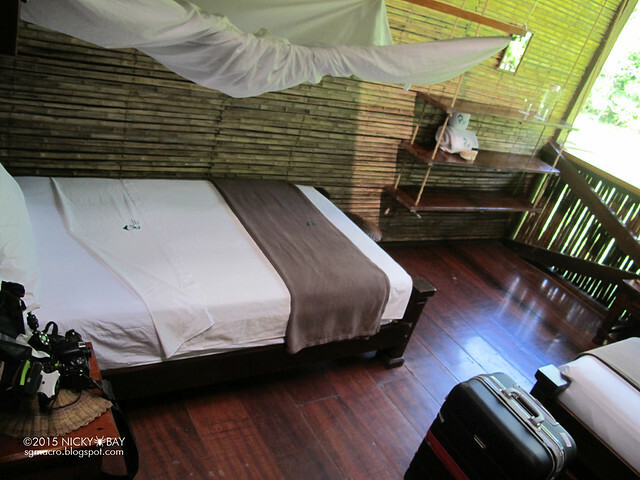 For those interested to see how the accommodation was like at Tambopata Research Centre or TRC in short, here are some photos of the lodge! Yes that was my room number. 2 beds with a safe box. Power generators are on at certain hours of the day. 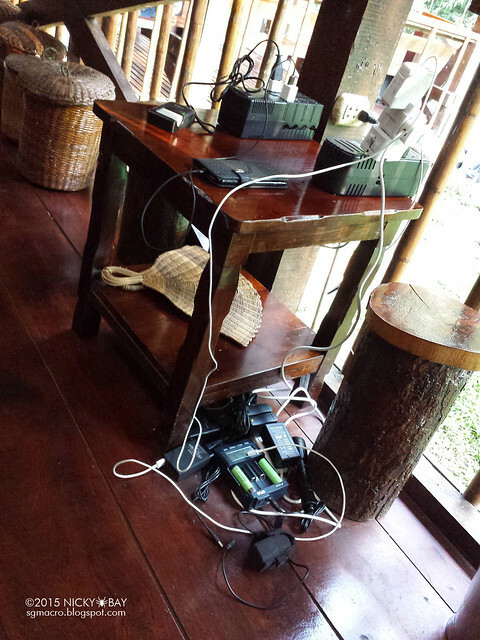 This is where I rush to charge my arsenal of batteries, phone and laptop. 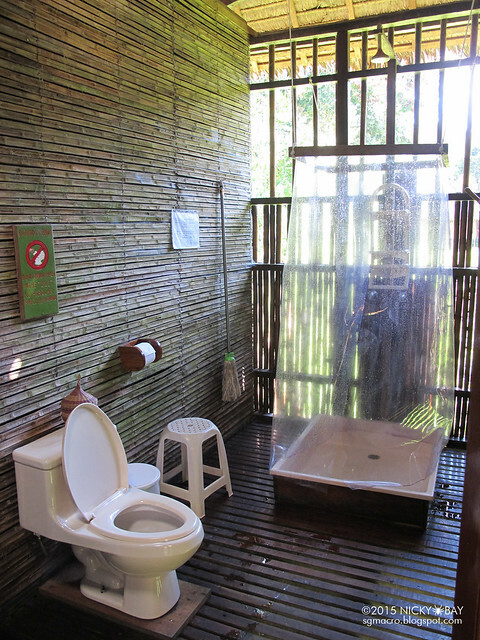 The showers and toilets are shared but very nicely done up. 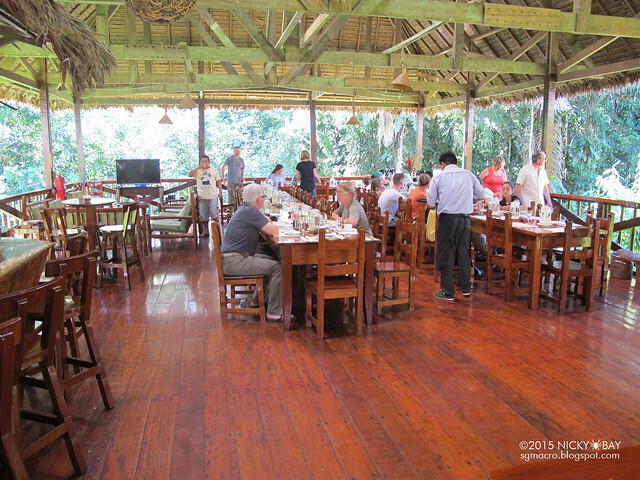 Communal dining where everyone gather and share stories on their day's discoveries. 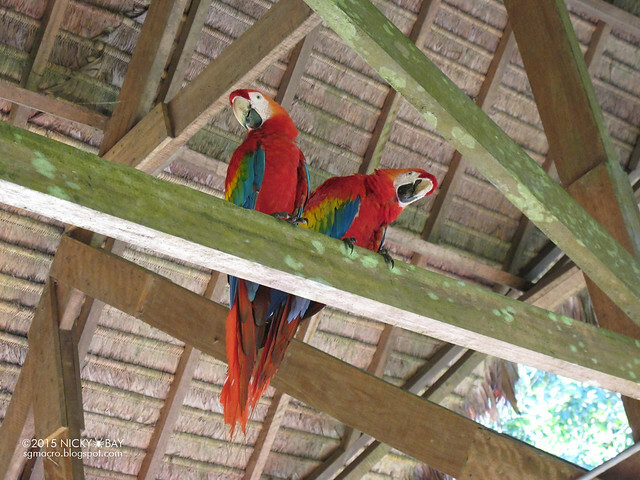 Some resident scarlet macaws roam around the welcome centre. Very naughty and they love to steal food from the dining area. 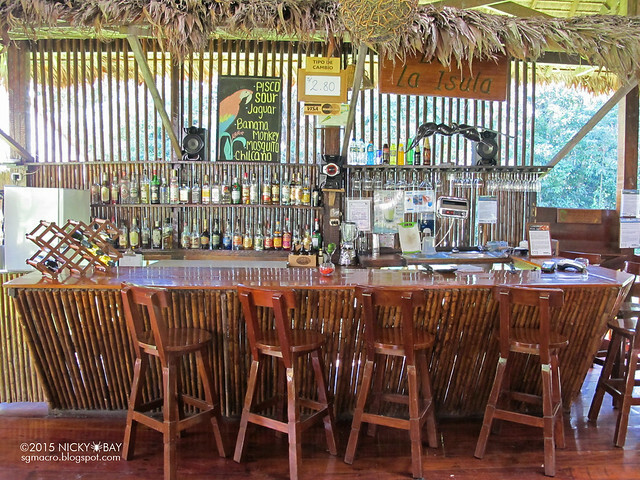 Alcohol and other cold beverages available here! 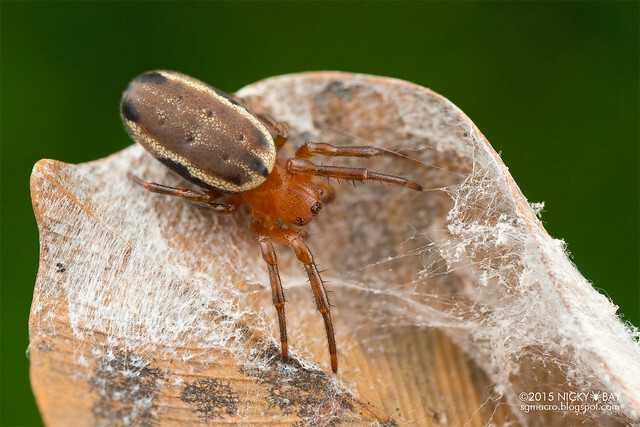 The past 3 blog posts had been all about orb weavers, because Araneidae is easily the most morphologically diverse family of spiders. 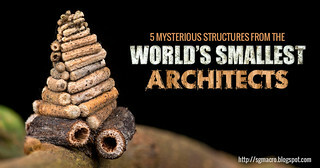 With that, future posts would focus on other exotic subjects from the Peruvian Amazon. From this week-long trip, I have selected and uploaded over 900 photos out of almost 4000 clicks on the camera on my Flickr stream. 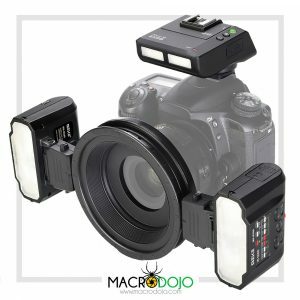 Remember that readers of this blog can get a 10% discount from bookings to the Peruvian Amazon via Rainforest Expeditions - just mention the discount code SGMACRO when making your reservations!